A friend sent me this article (click here, Mom) about my beloved Brian Skotko, MD, MPP and I knew I just had to share it with our blog readers. I have such a profound respect, admiration and appreciation for this man who has devoted his career to improving the lives of people with Down syndrome. 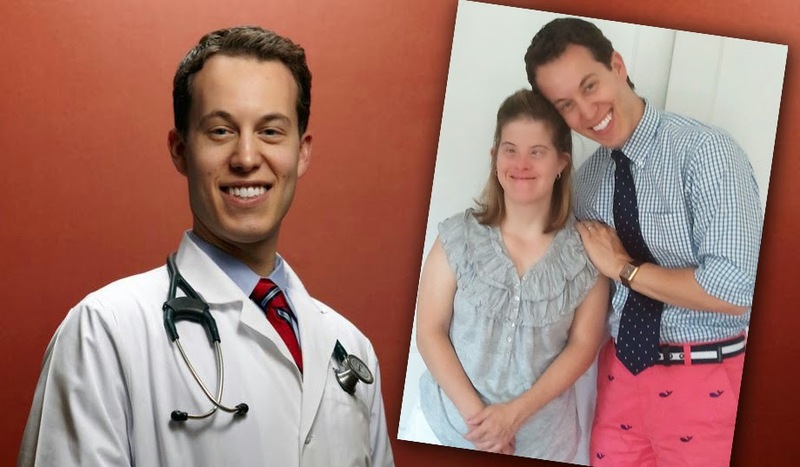 As a brilliant physician and Harvard professor, Skotko spends his days researching, advocating, and celebrating individuals with Down syndrome. What inspired this passionate focus? His younger sister, Kristin Skotko, who has Down syndrome. My affinity for Dr. Skotko results from the fact that we were born into the same circumstance - both of us have a sister with Down syndrome - and he "gets it". In a world where we feel like we have to constantly defend our siblings against society's unfair misconceptions, it's refreshing to find someone who is enlightening people to what Down syndrome truly is - and he articulates it so beautifully. YES! Exactly! Thank you, Dr. Skotko. Society may look at my sister and others in the exclusive chromosomally enhanced club as genetic blunders who are somehow inferior to those of us who are sporting only 46 chromosomes, but I've spent my whole life around people with Down syndrome and I beg to differ. A person's value is not measured by his or her IQ score. I frequently receive emails and comments from parents whose baby has just received a Down syndrome diagnosis and one of their primary concerns is how it will impact the child's siblings. We brought Josie into our family and I knew her extra chromosome would be a special gift to her future siblings. It would allow them to see the world from a totally different perspective. It would allow them to step outside the mainstream outlook that focuses on academic, career, and monetary achievement; in Josie's world, the focus becomes kindness, unconditional love, and slowing down to appreciate small victories and less superficial sources of happiness. Maybe the "limitations" that accompany Down syndrome are not limitations at all. Instead they remove obstacles that impede our ability to accept ourselves and be happy. Prior obtaining her current job in the café, my sister, Leanne, was in a sheltered workshop environment where she packaged screws and other small assembly items. She was paid based on her productivity. And it didn't matter if her paycheck said $4.63 or $15.25, she announced it with enthusiasm as though it rivaled Bill Gates' paycheck and she took great pride in her work. 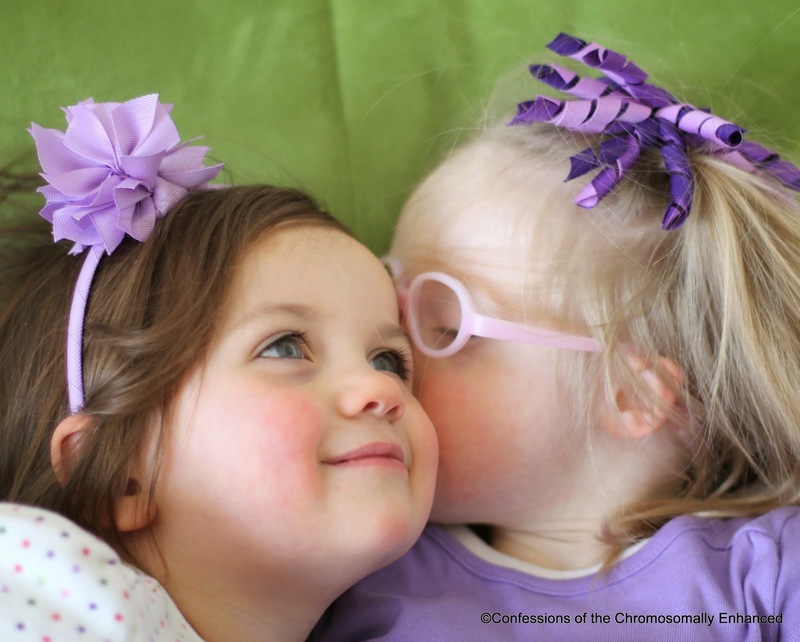 For more on this study, click on the "Living With Down syndrome" tab on the top of the blog - it's truly enlightening. People with Down syndrome are no longer isolated, and locked away in institutions. Thanks to my parents' generation, they live at home with their families, receive an education, and make a valuable impact on their communities. And today, thanks to the work of Dr. Brian Skotko and others who share his passion, individuals with Down syndrome receive even more medical care, therapies, and educational resources that allow them redefine the potential that their futures hold. 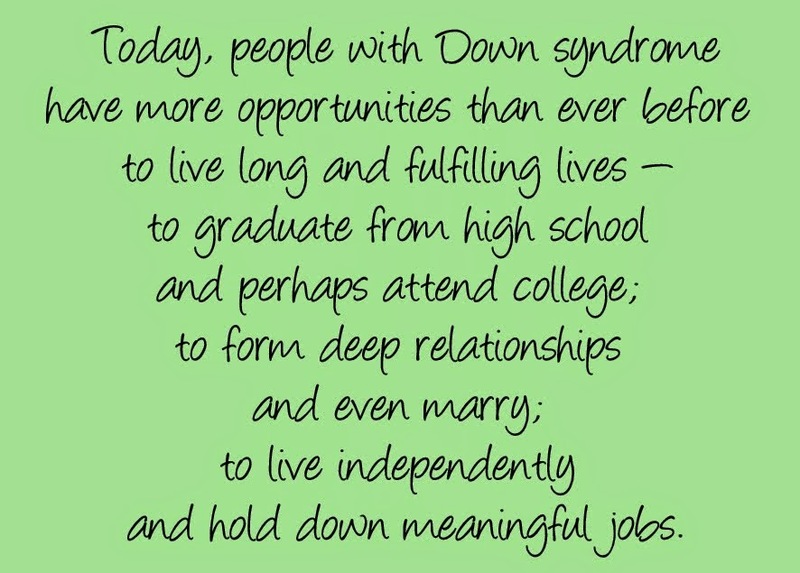 With more opportunities to be included in an educational and employment setting - to be included in and appreciated by society as a whole - the ignorance that exists about Down syndrome being defined by limitations and suffering is being replaced by a genuine appreciation for the contributions that individuals with Down syndrome make on the world. The best teachers don't lecture at us; they show us. The best way to learn is not to hear or read about a subject; it's to experience the subject. Leanne has been the single largest source of information about Down syndrome and the implications of the diagnosis that I could ever tap into. I've been a student in her class since the day I was born. And while not everyone has had the experience of growing up alongside an individual with Down syndrome, I believe that everyone who is fortunate enough to have crossed Leanne's path is a little more enlightened to what Down syndrome is. And thanks to people like Dr. Skotko, more people can learn to appreciate the diversity of the human condition and realize that there is more than one path to a purposeful and fulfilling life. That first picture of your girls... omgoodness. Melt my heart! That is PRECIOUS! I love reading about Leanne, Josie, and seeing both their gorgeous, true smiles! "There is more than one path to a purposeful and fulfilling life". That's the core point. I had the pleasure of meeting and listening to Dr. Skotko speak last summer at the conference in Indy. He has amazing energy! Thanks for the post! 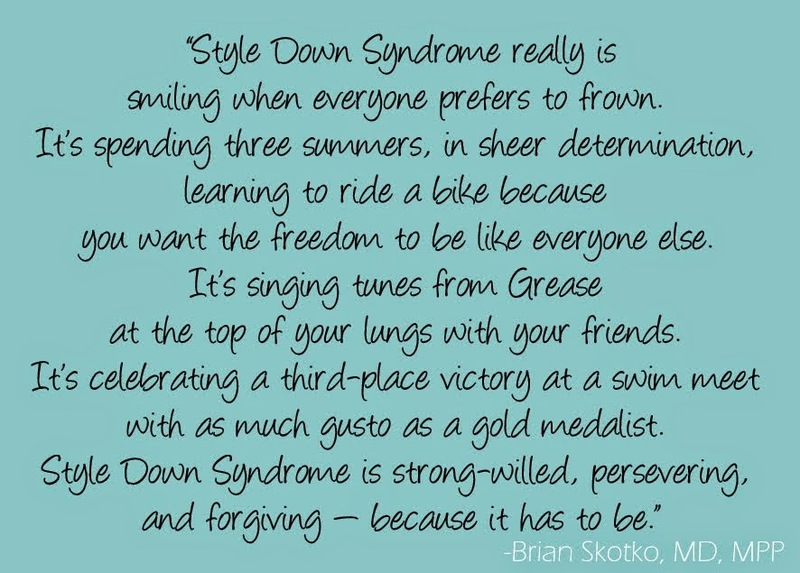 I had the pleasure of meeting and listening to Dr. Skotko last summer at the Down syndrome conference in Indy. He has such amazing energy! Thanks for sharing this post! Thanks for this post. My older sister who is 27 has Down Syndrome, while that sometimes has its challenges her Selective Mutism is an even bigger issue than just having DS for her. I love my sister despite the challenges she might face, despite not always getting along & I don't know what life would be without her. It's hard sometimes finding people who get being the special needs sibling so I enjoy reading your blog & following you on IG so thank you for sharing your point of view. I don't comment on blogs often & felt the need to share today. This might be one of your best entries yet. Well written and well said! I also have a sister with DS and we adopted our daughter with DS for many of the exact same reasons you have. Thank you for this! Your quote "Maybe the "limitations" that accompany Down syndrome are not limitations at all. Instead they remove obstacles that impede our ability to accept ourselves and be happy." PERFECT. um....how did I miss this post? This is brilliant on so many levels. I am so thankful to you for sharing your life with Leanne with us...and your thoughts on this subject. So valuable and encouraging!